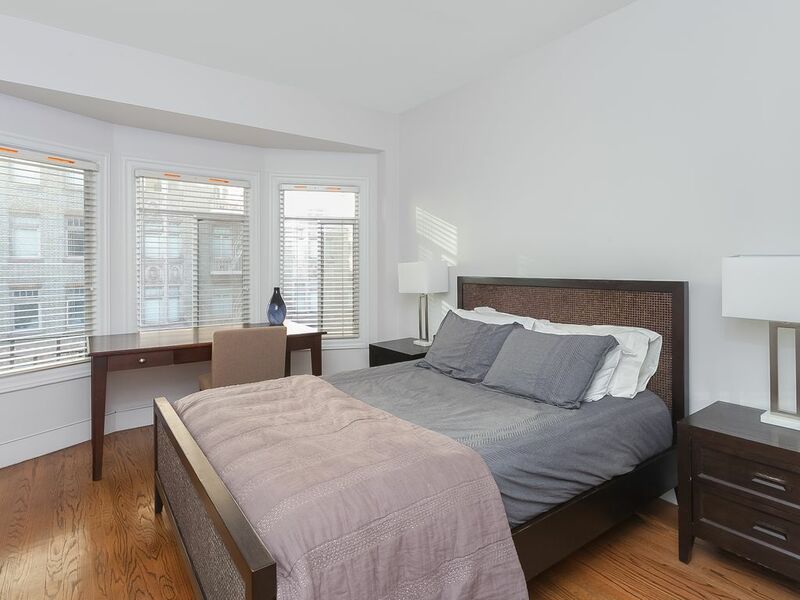 Private, furnished apartment conveniently located near Financial District, Chinatown, Union Square and public transportation. Choose from our junior 1-BR suites or our complete 1-BR apartments. Each apartment is well-apportioned with full kitchens upgraded with marble counter-tops, stainless steel appliances, gas range stove and equipped with everything you need to cook a full meal. The junior 1-BR features sliding divider that opens up to the living room for an intimate arrangement while the 1-BR offers a separate room off the living room and kitchen for privacy. -Coin operated washer / dryer in the building. -Utilities, Direct TV and Internet included in rental contract. Ritzy hotels, swanky lounges and restaurants make up the luxury of Nob Hill. Nearby, you will find Chinese buildings and small businesses that spill over into Financial District, and upscale boutiques in Union Square. The neighborhood is extremely safe and quiet. Stockton Corporate Rentals offer furnished monthly rentals from a studio to two bedrooms at the center of downtown San Francisco. Our rentals are designed for the self-serving independent traveler. We are available by phone or email and encourage guests to reach out with any questions or concerns during their stay. Pricing and availability are subject to change. A $1,500 refundable security deposit is due along with first month's rent at the time of signing the contract. The contract is based on the San Francisco Apartment Association lease, and a 30-day written notice is required to terminate the contract. Located on Stockton St between Pine and Bush St. The building is co-owned by Tim and Paul. We also own other beautiful apartment buildings in the city. However, because of its incredible location, this is the only building that we rent the units furnished. We both have families and take full advantage of living in such a vibrant city and wonderful part of the country. I jumped at the opportunity to buy the 12 unit building because of it's incredible location. Also prior to moving to San Francisco (from Manhattan), I had several extended stays in the city. However, I was never able to find a furnished apartment of the same quality of the finer hotels in the city. I decided that this would be the perfect building to remodel to luxury standards that discriminating traveler's desire. The unit descriptions do a good job highlighting the luxurious accommodations. Also, the building sits right on the dividing line of the Financial District and Nob Hill. Thus, it is walking distance to everything. Also, very unique for the area are the available parking spaces within the building and it is the only building I know in the Financial District, that I know, that has a private back yard garden. Ask about available options. Price not included. I stayed here by myself for one month while on a business trip in SF. The suite was small, but other than that everything was excellent. I couldn't have asked for a better location. Union square is literally on the door step, china town is 2 minutes away, financial district is 20 minutes on foot, and the embarcadaro/water front was 25 minutes on foot. I didn't use a car or any transport in the entire month I was there. The suite was very clean upon arrival, and cleaned without extra charge when I left. All together a great stay. My husband and I stayed in on of the 1-bedroom apartments for about 2 months while in San Francisco on an extended business trip, and we couldn't have asked for a better temporary housing solution. The high-end finishes and decor in the apartment are beautiful, the location is absolutely ideal, and Tim is a fantastic landlord and host. Being able to call this apartment home - even for just a short time - made for the perfect San Francisco experience.